Andy Guérif, a French artist, has combined modern signage on road with classic paintings and has published a book called “Le Code de L’art” (“The Code of the Art”). He was inspired by road signs that he discovered that each road signs has different meanings and he thought that each art work could also be represented by a sign. Therefore, he tried to associate each painting with a road sign. 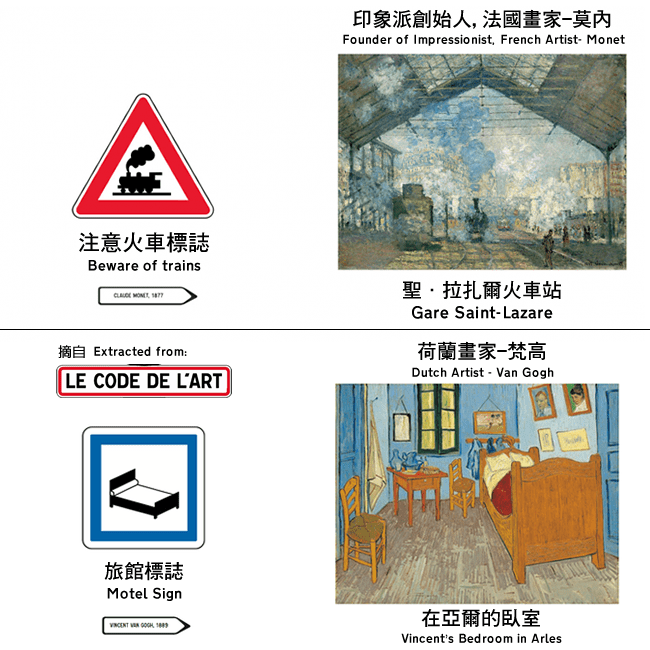 Nevertheless, there are no meanings of these road signs and detailed description of these paintings included in the book. The purpose of it is to give us a space to explore the world of art by ourselves and also the meaning of road signs which we usually ignore. This is like playing a searching game and allows us to use a relaxing way and new perspective to admire art.